This full color resin features an oval swirl of silver and gold shooting stars orbiting a swimming pool giving this piece a sense of motion. Add a personalized plate for your event for a modern, budget friendly award that is out of this world. 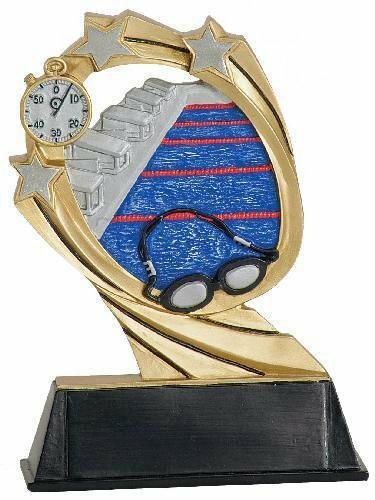 The star on this swimming award is leading the victory dance to celebrate a top notch performance in the swimming pool. Just add a plate to the base to personalize it for your star performers and this award is ready for your event or awards ceremony. This stunning medal design features a swimming scene encircled by a frame of 10 shooting stars. The ring at the top allows it to be easily attached to the ribbon of your choice, and it can be personalized on the back for your event. This is a budget friendly award for excellence in swimming that will surely be cherished by the recipient. The medals are available in antique gold, antique silver and antique bronze.